We’ve all got a favorite one of those fried chicken finger places. And the truth is, the best part about them is the sauce that comes with the chicken. Well, now you can make it at home! 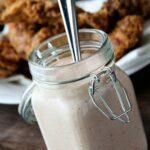 This quick and easy sauce is GREAT with chicken fingers and just about anything else you can imagine – french fries, fresh veggies, salads, seafood, anything fried, the list goes on and on… Apparently, this is a Mississippi thing, but we love it next door in Bama, too. The one thing to watch out here is for the chili sauce. Check out the photo of the ingredients – this ain’t no hot chili pepper stuff. Combine ingredients and refrigerate several hours to allow flavors to develop. Serve with everything! You’re right, it sure is a Mississippi invention, though we include a few other ingredients over here. It truly is a very versatile sauce that is good on pretty much everything, but especially our beloved seafood! And I LOVE you Mississippians for it, too! I originally tested this as nothing but a chicken finger sauce, but now that I’ve started trying it on other stuff, I want it on everything! It’s awesome! Good for dipping French fries took! Cant wait to try this recipe!! Stacy, you always have the best recipes! Thanks so much, Rebekah!! I love following all your success on Facebook!! I have been making a similar sauce. I add poppyseeds. Good sauce like yours makes even so-so chicken better. Thanks. 8please post your recipe with poppyseeds.?? I made this today. We did discover that if company is coming I will need to double the recipe. It will definitely be at all of our bowkl game parties! That’s great! I’m so glad y’all enjoyed it! This sounds so good for an ex Californian now living in Texas. I will make it for lunch today, Thank You for such a great sounding recipe. I hope you enjoy it, Marie! This sauce is so good with deep fried pickles! almost duplicates what they serve in some restaurants ! This looks SO good, Stacey!! Now, I have one grocery store in town, and I know that there’s a Heinz chili sauce that’s usually w/ the ketchup, cocktail sauce, etc. Is that what I need to get? Yep, get the Heinz Chili sauce. Enjoy! 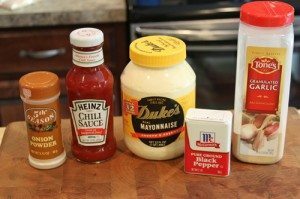 Sounds like the “fry sauce” they use in Idaho…..SO good!!! Definitely going to have to try it! There are lots of variations out there. I hope you enjoy this one, too!! I make a mixture of Mayo, Ketchup, Mustard and Tabasco Sauce or hot sauce of you choice. Whatever I have left I place in the fridge for later. Is this sauce very spicy? My wife doesn’t like anything that is the least bit hot. Is there a substitute I can use for the Chili Sauce? Terry, the sauce isn’t spicy at all. If you use just Heinz chili sauce, it’s just like flavorful ketchup. There’s no heat at all. This sounds wonderful. I usually dip my french fries in ranch dressing. Now, I have a new sauce to use on just about everything. Can’t wait to try it. How long will the sauce stay fresh in the refrigerator? I usually don’t keep it for more than a week or two… if it lasts that long. 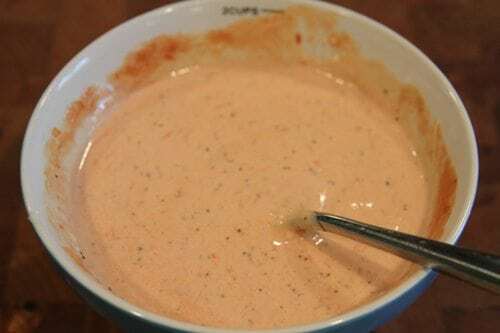 Utah calls this fry sauce. Invented in 1948 by Artic Circle. Migrated up to Idaho and parts of the NW. When did Missisippi come up with this? Just curious. How do I make this spicy? You can add in some ground red pepper or even some sriracha to give it a kick. I add Pick a Pepper Sauce to jack it up a notch. In the 1950’s the local Drive In Hamburger joint near the Univ.of Florida served it in medicine bottles and added Pick a Pepper Sauce and chopped dill pickles. Talk about good! 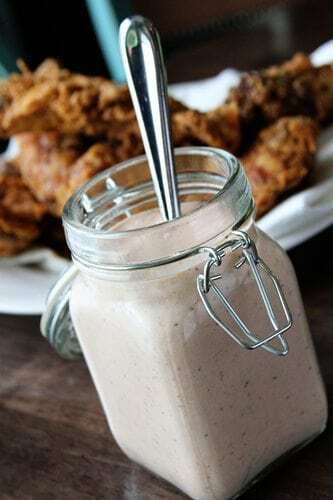 I have never understood the appeal of this mayonnaise concoction but it was intended as a salad dressing and is definitely NOT for fried chicken! I know a WHOLE lot of people who would beg to differ. Let’s not be critical just because it’s not your choice. If it taste good then it is for dipping if that is what one chooses to do with it. Get some new taste buds or treat the ones you have. They may even thank you. Who gives a rats petunia what it’s intended for…its good, a LOT of people like it. Your comments are not welcome here ! Hi Stacey, I made this sauce on the weekend and loved the result! I tweaked the recipe a little bit by adding a pinch of sugar, a splash of lime juice and some ground dried chilis for kick. Try a Tbsp of brown sugar and a scant tsp of curry powder! Great on sweet potato fries!